What Lies Ahead in Better Call Saul Season 5? For being the kind of show that some people thought wouldn’t play out as well as Breaking Bad, Better Call Saul has managed to thrive for four seasons. In fact before season 4 was over it had already been renewed for season 5 so you can assume that people have been waiting on pins and needles to know whether it was coming back or not. The whole idea of Saul in Breaking Bad was that he wasn’t the strongest man in the world but he was still someone that could be relied on, kind of, to do what was needed. So far Better Call Saul has focued on Jimmy McGill, not Saul Goodman, who Jimmy would eventually become, and despite any idea that he might have made the transition in season 4 it just didn’t happen. But there seems to be some thought that he could be making that switch in season 5, and it’s something that many fans might actually be anticipating at this moment. One thing to remember though is that the first two seasons both launched in February and season 3 came out in April of 2017, while the fourth season came out in August of 2018. So if you’re hoping to see season 5 land anytime soon you’re likely going to be waiting until around August 2019. That being said it does keep the show to a regular timetable and can give people a break in between so that they can catch up or perhaps spin the rumor mill into action trying to determine just what’s going to happen as the show keeps moving forward. One thing that’s clear is that people are going to be expecting certain characters to come back, but telling just who will make the cut isn’t always as easy as all that. However the three core characters that you know will be back are Jimmy, Mike, and Gus, since they’re alive when Breaking Bad starts and there’s no way to keep the continuity if they happen to just disappear for no reason. There are other characters such as Lydia and Huell that might come back, as well as Hector and the twins, Leonel and Marco. Those characters seem to show up intermittently at times and are prominent at other times so it’s possible that they’ll be kept as frequent visitors that will have substantial arcs that need to be explored. Ignacio will also be likely to show up since he’s been mentioned by Saul during the regular Breaking Bad series. At this point the only characters that are really uncertain are Kim and Howard since in the main show you don’t get to hear about them. That could mean very little, but as we all know the moment a character starts going unnoticed and unnamed it’s likely that they’ve been taken out. It has been stated that Walter and Jesse will be seen in the show, but since season 4 hasn’t given that to us then season 5 is most likely going to be where we’ll see the duo finally show up. The creator of Better call Saul has even gone ahead to say that they would be remiss to not include them before the show was over and done with. It’s even likely it seems that we could see a cameo from Hank. There’s no telling really but since Hank’s character has been around for most of Breaking Bad it only seems right that he might be seen in Better Call Saul at least once or twice. As to a Breaking Bad crossover, as some fans have no doubt been foaming at the mouth about, it would seem that it is going to happen. It kind of has to after all since Saul did become an important part of the show and is a character that can no longer be separated from the original program. 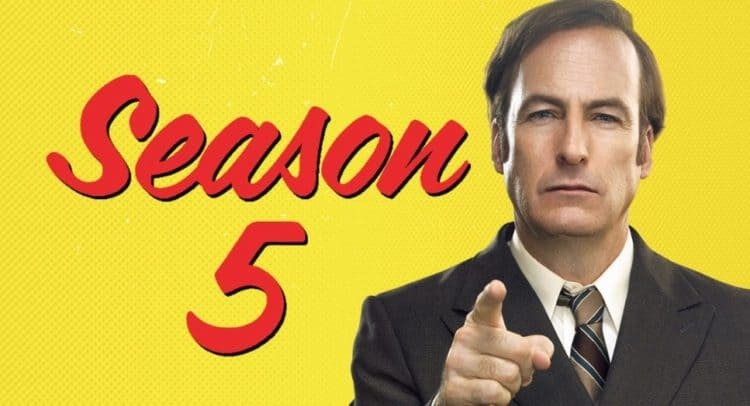 While the creator has stated that they take things season by season Bob Odenkirk has gone on to say that they should be showing a crossover of Breaking Bad in season 5. After all, people do want to see Saul meeting up with Walter and Jesse for the first time, especially since he somehow became such an integral part of the story. Saul seemed like a very weak character starting out if anyone was really watching, but somehow the spinoff series has made him into something that people really enjoy and have expressed a need to keep watching as the seasons roll on. It almost sounds as though the creator would be willing to delve into more seasons if allowed, but it also sounds as though season 5 could be the one that makes the final jump into Breaking Bad territory where Saul is still relevant but becomes less the main character of the story than he is an accessory to Walt and Jesse. For now though his show is still one of the most loved on TV.